The Nonprofit Success Pack (NPSP) provides the essentials needed to manage your mission and raise more resources. NPSP has already helped thousands of nonprofits accelerate fundraising, below are five ways it can help accelerate yours! Knowing important aspects of your constituents, ensures you reach them when and where they want to be reached. With NPSP, you can track address, seasonal address, affiliations, donation history, donation type and more, ensuring you gain a full view of your donor with a few clicks. Constituents give back in various ways , from donating their time to donating major gifts — you need a tool that can track it all. With NPSP, you can manage and track various types of donations like recurring donations, gifts in kind, matching gifts, honor memorial gifts, grants received, soft credits and partial soft credits — all in one place. Tracking donations and gaining insight into constituent information is important, but actively engaging with constituents and defining a moves management strategy to turn prospects into donors is just as vital. With NPSP engagement plans and levels, you can develop personalized, repeatable plans to engage prospects, creating a customized experience that will ensure you stay top of mind. Take a look at Brightstep Partners’ blog post on how to develop a moves management strategy with NPSP. 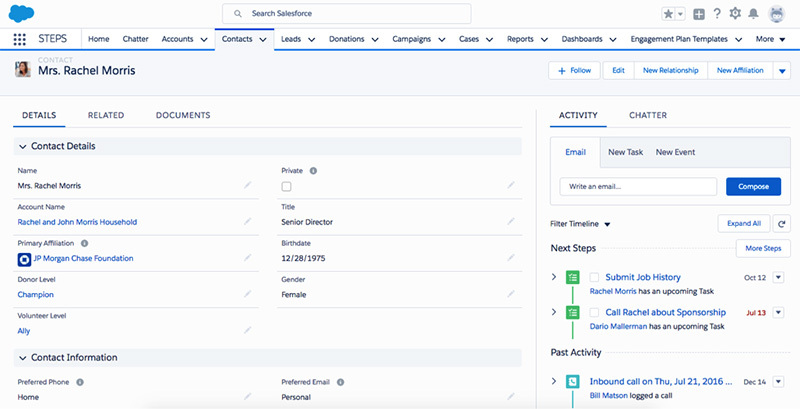 Harness the 60+ out of the box reports and dashboards that come with NPSP to show your donors, board members and constituents the impact your organization is having. Watch our webinar on what’s new in NPSP reporting. If NPSP doesn’t have a specific feature you need, take advantage of the AppExchange, a robust third party app ecosystem to fit various nonprofit needs.